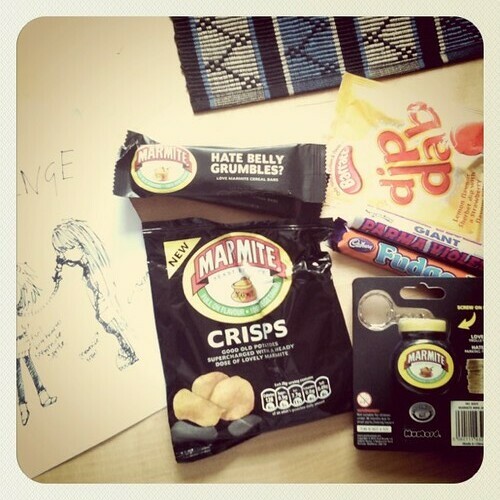 Icantdance » Blog Archive » Revenge of Marmite! « Little dolls in illustrations. 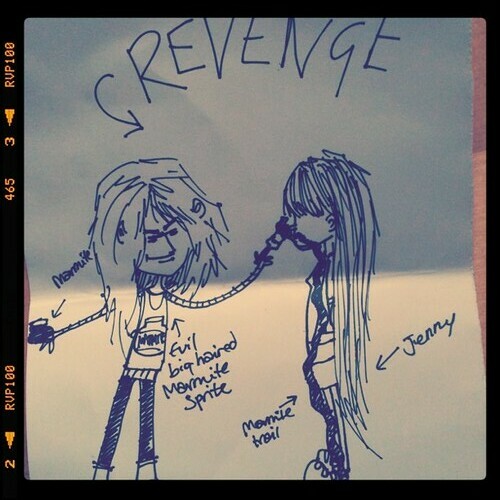 My lovely friend Wedgeh, a.k.a Big Pie, and I have this funny ‘Revenge’ going on. I send her massive packages of Liquorice, which she hates. She sends me Marmite in every form possible, which I.. don’t eat. This is her recent revenge after receiving a big bag of mixed liquorice and a yummy lollipop filled with salty liquorice salt. Marmite jackpot. The one thing I do like with Marmite is their packaging. And an extra lovely drawing of a Evil big haired Marmite Sprite smearing my face full of Marmite. This entry was posted on Tuesday, May 17th, 2011 at 18:45	and is filed under Days. You can follow any responses to this entry through the RSS 2.0 feed. You can leave a response, or trackback from your own site.